under a much younger and prettier woman's bed. In my late teens and early adult life, Erma Bombeck's hilarious take on everyday life would help me keep my head above water when life was tough. Who can forget - If Life Is a Bowl of Cherries, Why I Am I Living in the Pits? The underlying mantra - no matter what life throws at you, you just gotta laugh! Since her passing in 1996, there really has been no one new to lead me with a laugh through the trials of everyday life - well until now. 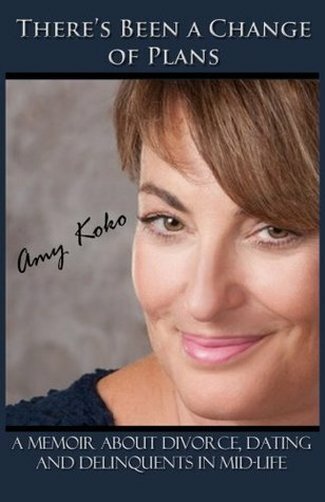 Enter Amy Koko! There's Been A Change of Plans: A Memoir About Divorce, Dating and Delinquents in Midlife is a welcome opening salvo by this author. Koko has her own unique author's voice and writing style, but that same ability to look at the highs and lows of life with humour. She openly shares her trials, laughs at her mistakes and shares about her very normal kids without apology. Her book follows her crazy journey dealing with divorce after 27 years of marriage and weathering trials as she works to keep her four kids from straying too far down the wrong path. The story is told with an amazing wit that, despite the difficulties faced, kept me laughing from start to finish. new goals? Take the time to figure it out." Check out a great behind the scenes author interview - HERE! After 27 years of marriage, Amy Koko went into divorce, kicking, screaming, stalking and drunk texting but lived to tell about it. She is the creator of the popular blog Exwifenewlife and a contributor to Huffington Post Divorce as well as Huffington Post Women. Amy lives in St. Petersburg, Florida where she begins each day with a freshly ground cup of good coffee and ends it with a good glass of pinot noir. Or chardonnay. Or a dirty martini. Whatever's handy.